What followed in Moscow was a strong show of confidence by Mexico and a morale-boosting (and fully deserved) 1-0 victory, while a beaten Germany side have some big questions to answer. The most startling aspect of Germany’s play here was their lack of discipline at the back. Time and again their backline was caught out by blistering Mexican counter-attacks and, were the opponents that bit more ruthless, they would have conceded far more than just one goal. 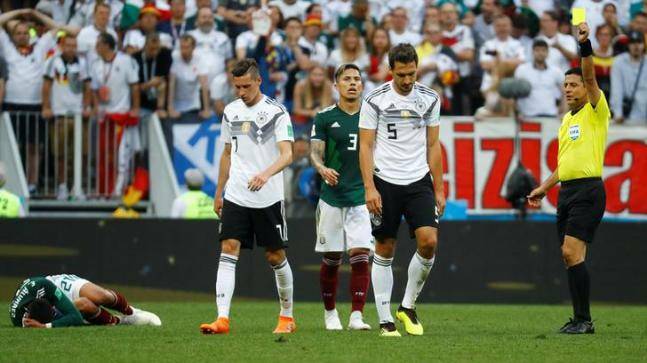 “Our cover was often not good and we were left many times with just Jerome (Boateng) and myself in the back,” said centre back Hummels, one of several Germans who will not want to watch a replay of Hirving Lozano’s 35th-minute goal. First Khedira was robbed deep in the Mexico half. Hernández sniped away from Jérôme Boateng and Mats Hummels. A flurry of skimmed passes across the wide-open spaces of the Germany defence left Lozano in space in the area and finished it off beautifully cutting inside Ozil’s futile attempt to offer defensive cover. With Ozil, Draxler, Mueller pushing forward leaving huge open spaces at the back of midfield, into which Mexico’s three-man attack poured like a green-shirted piranha swarm. This was a champion team out of kilter, stung by what was arguably an act of disrespect to their opponents, a failure to appreciate their threat and the fine planning of Carlos Osorio, and never really able to regain its balance. With Jonas Hector ruled out, Marvin Plattenhardt of Hertha Berlin had come in to play at left-back.He only passes backwards when he gets the ball, inviting pressure, without it, he simply sits wide waiting for a crossfield ball and doesn’t make any attacking or overlapping runs. He’s in too advanced a position to be defensively useful on a counter, then when he drops into the defensive 4-4-2 shape he has a terrible habit of dropping too far to play strikers onside behind centre backs – there’s a communication breakdown between himself and Boateng and Hummels that can be preyed upon. He’s not confident enough with the ball at his feet to be used in attacks, losing possession on more than one occasion. 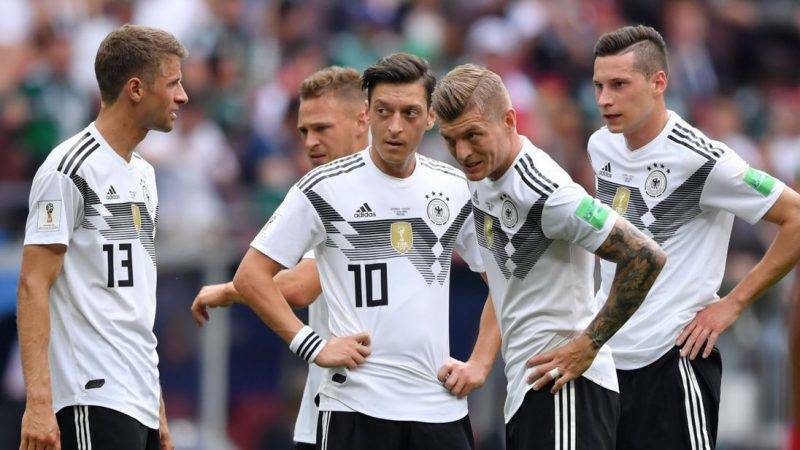 Kimmich’s attack-minded tendencies constantly caused Germany serious problems when they lost possession, because Mexico’s dangerman Herving Lozano, playing on the left, remained in a position to counter-attack and regularly found space on the outside of Boateng.